Whether you are a teacher, counselor or group leader, roleplay scenarios can be an effective addition to any curriculum used to teach youth anger management skills. Good scenarios make students more aware of situations that cause anger to flare out of control. Adapt roles and gender to suit your class. The facilitator's role is to prompt when necessary, but try not to influence the students' work. You're in the line at the school cafeteria and a group of kids push in front. You object. They say their friend was saving their places. You think the friend is afraid to tell them to go to the back. Show how you feel. Try to get them to move to the end of the line. Facilitator: Ask what kind of anger the person feels and why. Does he feel threatened and helpless? Does he think it's unfair? How can he diffuse the situation? Should he involve other kids waiting in line? Your mom asks you to stay with your sibling while she goes to the store. You've arranged to meet your friends to see a movie and they'll all be mad at you if you're late. You don't want to miss the film. Facilitator: How do you feel? What can you do about it? How can you ensure it doesn't happen again? Can you come to an arrangement with your mom about babysitting for your sibling? You have to leave a party because of your curfew but the friends you should ride home with want to stay. They assured you they'd all go home at the same time. The same thing happened last week, and if you're late you'll be grounded. Facilitator: Who are you angry with? What do you think of your curfew? How do you feel about your friends? Do you regret coming to the party with them? How can you solve the problem? What will you do in the future? You didn't finish a long homework assignment because you were at sports practice. You have another practice after school today, but now your teacher says you have to stay after school and complete the work because you always hand in assignments after the deadline. However, if you don't go to practice the coach might replace you on the team. Facilitator: Why are you angry? Are you annoyed with yourself or the teacher? Is your anger the result of self-imposed stress through poor time-management? Is the coach to blame for calling too many practices? How can you diffuse the situation? Is there some way to talk your teacher round to your point of view? Someone smashed the rear light of your dad's car when you borrowed it. He blames you, but you say it was parked in the parking lot when it happened. Now he won't lend it you this evening and you told your friends they could ride with you. Facilitator: Why are you angry? Who are you angry with? Are you angrier with your dad for not believing you, or because the car was damaged? What's the best way to deal with the situation? How can you calm things with your father? If you are not used to using roleplay, you'll be surprised at how effective a tool it is. Use the facilitator prompts to help the sessions go smoothly. Get the most out of the activity by following some tried and true tips. Facilitate the discussion with students by writing the scenario on the white board. Ask how they would react to the scenario. Do the other kids agree: would they behave the same way? How would they feel? Try to break down the kind of anger the kids feel so they understand the root cause. Ask how they could diffuse the situation. Do they have any methods for calming themselves down when they are angry? Divide the students into small groups or pairs. Present each group with a slip of paper with the scenario written out. Ask the kids to act out the scene. Each group presents its scenario to the rest of the class. 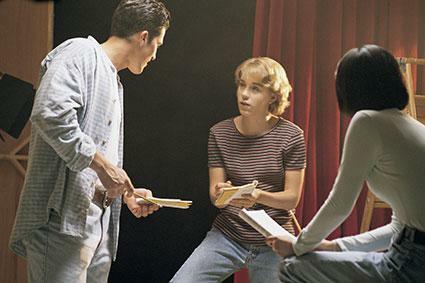 Get audience reaction to each performance and compare ideas. Compare how two different groups presented the same scenario. Did the audience find any reactions too extreme? Would they recommend any calming techniques to the pupils with exaggerated responses? Be sure the students have plenty of time to discuss each group's presentation. Students gain the most when they give their solutions rather than having solutions suggested to them. Youngsters are often astonished at how differently classmates tackle problems and will give each other advice on how they should have behaved. Point out anger is a response to a condition that produces stress.